I am getting ready to say goodbye to Baby Incredible. He will leave me in just a few short hours after spending the last 8 months or so with me. Even though I say I am getting ready for him to leave me, I can never actually be ready. Although I did not give birth to him, I have been his mom, in every sense of the word, over the last eight months. Leaving him today feels like I am abandoning my own child. He is going to wonder where I am and why I’m not coming back for him…I keep telling him that I love him and that I don’t want to let him go. He may not understand, but I hope he feels my message. Heartbroken is the adjective that comes to mind. Foster parents volunteer to get their hearts broken. They know going in that this is not forever, but they choose to put their heart “all in” to that baby anyway, to bond with them, and to attach to them, and to love them as if they were their own. This entry was posted in Foster Parent and tagged baby, faith, foster, God, goodbye, heart, heartbreak, love, mom, surrender, trust on June 20, 2013 by mamamango. It’s been five months. It’s been 22 weeks. It’s been 154 days. That’s how long I’ve had Baby Incredible. I expected to only have him for one or two months, although I knew there was a possibility it would be longer. I don’t know for how much longer I will have him. And that feels strange to say. I’ve had him since he was so little that it feels like he is mine. In many ways he is, which is what makes it so hard to think about him leaving me. Some think I’m crazy or even masochistic for doing this knowing that this is only a temporary situation…and an indefinite one at that. Sometimes I think I’m crazy or masochistic for the very same reasons. I keep going back to the book “Middle Mom: How to Grow Your Heart by Giving it Away” by Christie Erwin. One of the things she wrote that really stuck with me was that people always ask her how she does it. How she takes in children and loves them as her own, only to ultimately give them up. They often say that they could never do something like that. I have had people ask me the very same thing. I have had people tell me the very same thing. What has stayed with me is her response. Christie says that if you are a person who says you could never do it, you are precisely the kind of person who is needed. She goes on to explain that in order to be a good foster parent, you have to give your whole heart to the baby or child, even though you know you are eventually going to be faced with the pain of loss. Talk about sacrifice. Being a foster parent is the closest I’ve ever come to loving like Jesus. And I certainly couldn’t do it without God. He is the one who led me to foster, and I have to keep reminding myself to go to Him when I am feeling the strain of being a single working foster mom. This is God’s plan, so I know He has my back. Looking ahead, anticipating when Baby Incredible might go, worrying about what problems may arise between now and then (because this time around it seems that there is a “crisis” every time I turn around), wondering how this is going to play out, is only hurting me. It’s causing me to take my eyes off of God, to lose my hope and my faith and my trust in Him. God has an amazing plan for Baby Incredible’s life and an amazing plan for my life. My prayers need to be centered on those truths. I need to cherish the moments that I have now, for where I am right now is exactly where God wants me to be, even though I don’t understand it. He wants me to basque in every smile and giggle and coo. He wants me to enjoy every moment: every bottle I make, every cry I soothe, every diaper I change, every smile I induce, every song I sing, every time I rock him to sleep. I know that when he is gone, I will miss everything…even the sleepless nights and long commutes and things that I can’t do because I am providing love and care for a little baby who is so very special. Is it going to hurt when he goes? Absolutely. Will I always wonder how he is doing or if he is in pain or what he is learning in school or who he is becoming? Yes. He has left an indelible mark on my heart. And for that, I am honored and grateful. This entry was posted in Foster Parent and tagged baby, faith, foster, foster mom, foster parent, God, hope, Jesus, love, mom, pain, peace, pray, prayer, sacrifice, single mom, surrender, trust on April 9, 2013 by mamamango. Some days I wake up feeling ready to face the day. Maybe I don’t feel totally rested, and more likely than not, I didn’t get enough sleep, but I feel pretty good. I take Baby Incredible to daycare and head off to work. As things come up in my day, which they inevitably do, – being a middle school teacher means being ready for the unexpected – I handle them with confidence and grace and wisdom. Maybe a kid throws up all over my classroom floor. Maybe a parent sends a five paragraph letter, addressing some concerns. Maybe the fire alarm goes off unexpectedly, prompting an unplanned drill. Or maybe, it’s just a “normal” day with preteens: teaching and redirecting and laughing and disciplining and lesson planning and paper grading and dress code violations. I end my day at work and get to see Baby Incredible and his heart melting smile. We go to whatever appointments we may need to attend that day, and then we come home to prepare for the next day. When I have spent some time with him and then rocked him to sleep, I get a little time to myself before I get some shut eye. 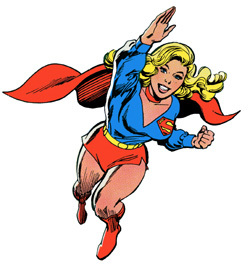 Those are the Superwoman days. The days where I feel amazed that I have been able to accomplish so much and do it with peace and joy and a seamlessness that can only be attributed to God working. And then there are days like today. The days that may even start out as Superwoman days but end up being Wonder Woman days. On Wonder Woman Days I end my day feeling as if I was hit by a mac truck. I wonder how I ever accomplished all of the things I did. I wonder how I didn’t say something completely inappropriate or mean. Sometimes I wonder how I let that inappropriate or mean thing fly out of my mouth! I wonder why on earth I’ve taken on so much. I wonder when I will get a break. I wonder how I will make it through tomorrow. I wonder if I am on candid camera. I wonder just how much more I can handle, and then I shudder at that thought, thinking it may cause something else catastrophic to happen. On Wonder Woman days, I need to pray with my friends. I need to cry. I need my boyfriend to bring me dinner at 8:30 at night because I haven’t been home but a few minutes and have zero energy to make myself anything, even if there were groceries in the house. I need a hug and to be told that everything is going to be okay and that I’m doing a great job. I need to be reminded of why I’m doing this and that God is in control of every last detail in Baby Incredible’s life story. I need people to make me laugh. Today, I got all of those things after my Wonder Woman day, and I feel truly grateful and blessed. 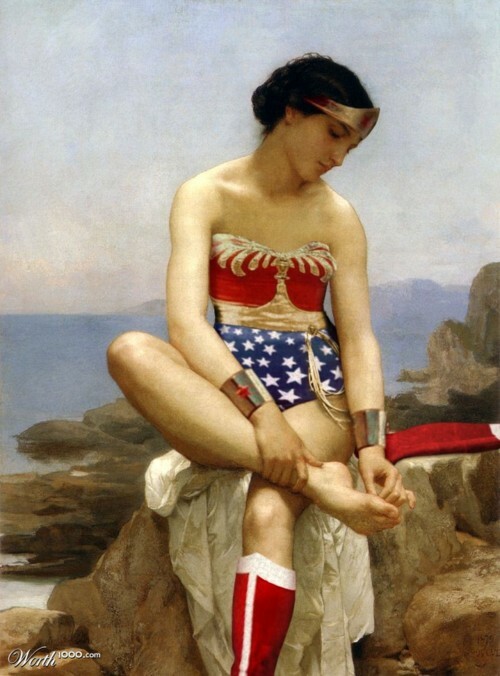 Thank you to those of you who loved me through my Wonder Woman day. You know who you are, and you are blessings in my life. This entry was posted in Uncategorized and tagged baby, foster, foster mama, foster parent, Friends, God, humility, laugh, mama, mom, peace, prayer, smile, superwoman, surrender, teacher, teaching, wonder woman on March 13, 2013 by mamamango. For nearly all of my life, I have wanted to be a wife and mom. For at least ten years, I have waited sometimes with hope, sometimes completely without hope, and sometimes somewhere in between for these desires of my heart to be met. I tried dating services, some free, some more expensive than I’d care to remember, friends set me up on blind dates, family members set me up on blind dates, I stopped going out on dates, I started going out on dates again. I cried on friends shoulders, I lost all hope, I prayed, I kept myself so busy that I didn’t have to think about it. I watched friends and old roommates get married and have one baby, then two, some even three. I watched my sister get married and have her first baby, my beautiful niece, whom I adore. I buried myself in my work. I devoted my life to God and fought for surrender to his plan for my life. I got connected with families with babies so I could be an involved auntie. I developed friendships with some amazing people, without whom I would not still be faithful. A husband and children were still very much desires of my heart. I waited. I have a good friend who always told me, when I was feeling hopeless, that God could change anything in a second. In my melancholy, I always argued that He wouldn’t do that for me. I believed that it could happen for other people, but not for myself. Now I chuckle at the prophesy of her words. God DID change everything in “a second”. In May 2012 I decided I wanted to be a foster mom. In July 2012 I was certified, and days later I had my first foster baby. Three weeks later, I had an amazing boyfriend. What a whirlwind of blessings! I teach a personal development class at school, and one of the concepts we focus on is “change”. One of the things that I’ve learned about change, through research and experience is that good or bad, planned or unplanned, self initiated or not, all change can be stressful, and usually is. Being a new mom is stressful. It’s beautiful and amazing and wonderful and such a gift, but it is stressful. I don’t think I know a new mom who would disagree with that. Being a new single mom to an infant (who is not my own and comes with a “team” of adults we both have to connect with) while teaching full time and nurturing a new relationship is incredibly challenging. I have another friend who describes the above circumstances, my circumstances, as “a pressure cooker”. It really kind of is. It’s the perfect storm. So why do it? Because babies have been my heart since I was a child. There is something about their innocence and their complete vulnerability and newness that I am so attracted to and always have been. I love babies. I’ve often wished that there was a job where I could hold babies all day long. Babies are important to me, especially these babies, the ones who are born into circumstances that they did not ask for, circumstances that range from less than ideal to horrific. That’s why I started this journey back in June. What a gift to be able to give as a single woman who is passionate about these precious little souls. What I was not expecting God to do was to give me an incredible boyfriend right as this journey started. When all of this began to unfold in August, I kept sharing with people that God’s plans are always so much better than our own and that I never would have written my story this way, but that I am so grateful the God is a better writer than me. I am holding onto that now, because some of my desires and plans are being delayed due to God’s plans for my life and for His plans for this baby’s life. It is easy to get discouraged about this because it feels like I’m so close to receiving the desires of my heart, yet I’m so far. This entry was posted in Uncategorized and tagged affliction, baby, blessings, faith, foster baby, foster mom, foster parent, God, hope, love, mama, mom, obey, patience, perseverance, surrender on January 18, 2013 by mamamango. When speaking with parents of children who have social anxiety disorder, one of the first things I tell them is that they need to prepare their kids ahead of time to go into a social situation which might cause anxiety. I know this well, because it is true for me, too. I generally don’t do well with surprises or last minute changes or with something that goes a different way than I expected. Plans help me. Routine helps me. Certainty helps me. Yet, the world is ever changing, ever unpredictable, ever uncertain. And I have to adjust to that as best I can. Sometimes I do so with faith and grace and maturity, and other times I allow my fear and faithlessness and sadness take over. Less than a week ago, I posted that I had received news that Baby Incredible would likely be moving to a new home at the beginning of February. Less than 24 hours after I received that news, I learned that the family member who was planning to take him decided that she couldn’t take him after all. This shouldn’t have been a surprise. People are unpredictable and messy, therefore, the foster care system is unpredictable and messy. Sure, there are rules and protocols, but that doesn’t mean that they are always heeded. After somewhat getting over the shock of two completely different updates within a 24 hour period, I began to ask questions about what that meant for Baby Incredible and his placement with me as his foster mom. What I learned was this: Unless this family member has a change of heart, there is no one else in the family who is able to take him at this time. It has been recommended that the parents be given some more time to do what they need to do to prepare to get him back. This could mean that Baby Incredible would stay with me for up to another 6 months. BUT anything could happen between now and then, like the family member changing her mind, another, up til now unknown, family member could step forward, or the decision could be made to send him to a foster/adopt home where the foster parents would be willing to adopt him IF the parental rights are terminated. So, basically, what was originally thought to be a shorter term placement of 1-2 months has turned into a placement that could potentially last 8 months. But, anything could happen between now and July, literally anything. Like I said, I don’t do well with uncertainty. God has been refining me in this area of my life. For the past four years my job has been in jeopardy because of layoffs. Each year, I receive notice that I may or may not have a job for the following year. Each year, for the past four years, I have lived in uncertainty about this for months before getting word that I would indeed be back the following year. I never lost my job, praise the Lord, but God did make me wait in uncertainty before he revealed to me that I was safe. I believe that God was teaching me many things through such trying times. He was teaching me to trust him completely, to lean on him fully, and to be joyful, not because of my circumstances, but because of his love. (Romans 12:12) First I fought this. Then I fought through it. Then I fought for it. I failed, I fell, I took one step forward and two steps back, but I came through it by the grace of God. My pastor once shared that we can only see the road ahead of us, but that God can see around the corners. Sometimes I wish I could get a sneak peek. This entry was posted in Uncategorized and tagged baby, faith, fear, foster, foster mama, foster mom, God, grace, love, mama, mom, peace, surrender, trust, uncertainty on January 14, 2013 by mamamango. I just took a call from the woman who places babies at my agency. She was one of the facilitators in my certification classes, and I always really liked her. She’s been doing this for a long time, and she is honest and fair and loving. Tonight, she wanted to see how I’m doing after my first baby has come and gone. She asked me about my time with Little Dude and about how it was to do all of the paperwork that goes along with being a foster parent. She asked me how I am adjusting to being back in the “real world” and back to teaching. She listened to me as I reported to her the two missed medical appointments I have received notices about and asked me to send the information to her so she can follow up with the county social worker about it. At least the CSW will have one more person in her ear about it. Medical appointments are important for babies who were born prematurely. It makes me wonder how Little Dude is doing, if he is getting his needs met, if he is thriving in a household with four children under the age of 8. I told the baby placer lady that I would be ready to take another baby in the next few weeks and that I’d call her and let her know when exactly that would be. When I hung up with her, I realized that it has been exactly four weeks to the day that I took Little Dude to the DSFS office so that I could hand him over to the family members who are now caring for him. I feel sad. I do miss Little Dude. I do wish the family would email or text me a picture so I can see how much he’s grown in the past month. I do wonder how he’s doing. I take that to God and pray because maybe it’s better for me not to know, and whether it is or not, I have no control over whether or not I hear from them. I feel sad that the baby placer lady is calling me exactly a month to the day that I gave Little Dude to his family. That means there are babies she’s trying to place. I can’t wait until the day a few weeks from now when I can call her and tell her I’m ready again. I can’t wait to see whom God has in store for me. I know that s/he will change my life in whatever amount of time I get to have with him/her. Yesterday I got to work, and it was one of those days where there was a lot of conversation with co-workers. They were asking me about another co-worker, a good friend of mine, who has been out sick. They were asking me how I’ve been since the baby went to another family. They were asking me how my relationship is going with my boyfriend. It was good, but it was a little overwhelming. Nothing I couldn’t handle, just more than a normal day. Then I went to my mailbox and found a blue bib with brown piping around the edges. In the middle it said, “Lil’ Dude”. It was lovingly placed in a large zip lock bag. I immediately felt emotion well up. I had been “fine” that morning, so fine, in fact, that I could even talk about Little Dude going to his new home without getting emotional. There was no indication of who the gift was from, so I asked who gave it to me, not expecting to hear an answer, but more just wondering out loud. The giver was in the office, a good friend of mine who I have known and worked with for nearly nine years. 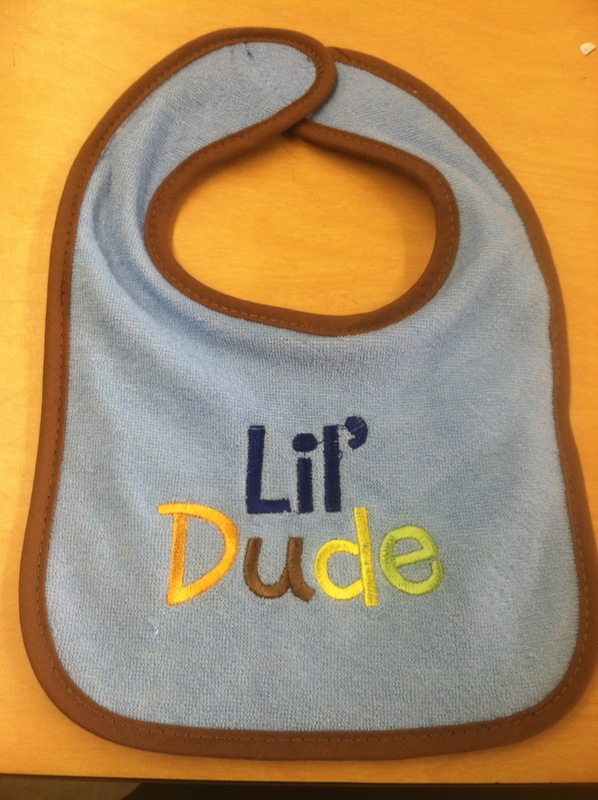 She has kept up with my blog and knows that I refer to the baby as “Little Dude” and wanted to give me something special to remember him by. I cried…not like a single tear or two dripping down my face, but like really cried. I cried out of gratitude for such a thoughtful gift. I cried out of sadness that Little Dude has moved on and I may not know what comes of him. I cried out of the pain of the hole that has been left in my heart…a hole that I know God is going to fill in. When I got home that day, I got a phone call from my agency social worker. She needed to get some paperwork from me, but the main reason for her call was that she wanted to see how I was doing, how I was processing giving up my first baby. She also wanted to confirm that I was going to take a break for a month before accepting another baby because she had people at the agency asking her who she had available to accept babies. I confirmed that I would, indeed, be taking a month off. When I got off the phone, I cried. I cried because, although I know that it is the right thing for me to do to take a break for a month, I am afraid to surrender MY plans to God. I am afraid that taking a break will mean that Little Dude was both the first and the last foster baby that I will get to take care of. I cried because my agency is turning down four or five babies a day because they don’t have families to send them to, and I have the space in my heart and in my home to take care of them, to love them, to nurture them. And I want to do it. I feel called to do it. All of that being said, I have recent experience with surrender. I know that God’s plan for my life is infinitely better than MY plan could EVER be. I know that God will take care of me. I know that my surrender will mean his blessings. This call to surrender is a reminder that I don’t call the shots, God does, and I am happy to follow because I know His way will always be better than mine. I don’t want to be in control of my life. My best-laid plans have gotten me into some bad places. God’s plan always leads me to wonderful places, most notably, back to Him. With all of the tears yesterday, I got to laugh a little today with a good friend who I got to talk to for over an hour on the phone. I make a lot of references to the show “Friends”, and it is all the better when the people I am talking to know what I’m refereeing to. So, today, I told my friend that I was relating to the “Friends” character “Phoebe”. She was a surrogate for her brother and his wife and was pregnant with triplets. I told my friend that I relate with her having to give up the babies after caring for them in the womb for 9 months. Yes, I relate to Phoebe. I do want to keep one. But mostly, I just want to follow the plans God has for my life. His story for me is amazing. This entry was posted in Uncategorized and tagged baby, foster, foster baby, foster mama, foster mom, God, goodbye, love, prayer, sad, surrender on September 27, 2012 by mamamango.